When most of us picture an endangered species, we tend to think of animals like cheetahs, bald eagles and rhinos. These are all large, poster-worthy animals that live in far-off exotic places and easily capture our imagination. The problem with this is that we often don’t consider the species in our own backyards that also require conservation and protection. An example of this is the cave salamander (Eurycea lucifuga). 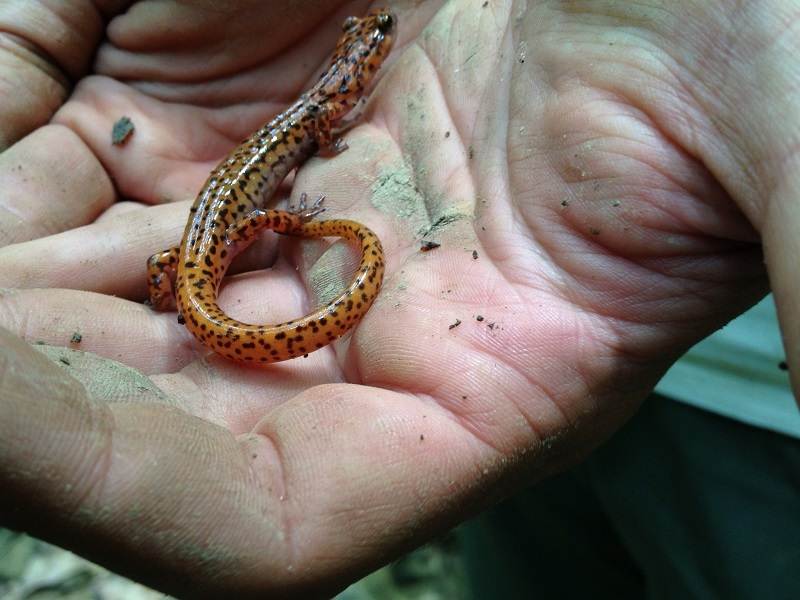 The cave salamander is a state endangered species and, in Ohio, is found only in Hamilton and Adams counties. The populations that live in Ohio represent the northernmost extent of its range, and they are threatened mostly by habitat destruction. As their name implies, they prefer to live near entrances of damp limestone caves or outcroppings, but they can also be found in mature woodland areas and cool spring-fed streams. The one pictured above was found in Miami Whitewater Forest while conducting a headwater stream assessment. Hopefully with proper care and protection, the cave salamander and other endangered species that call the Great Parks home will be around for future generations to appreciate and enjoy.